Babies Take Longer To Come Out Than They Did In Grandma's Day : Shots - Health News The typical first-time mother takes 6 1/2 hours to give birth these days. Her counterpart 50 years ago labored for barely four hours. That's a finding with big implications for current rates of cesarean sections. 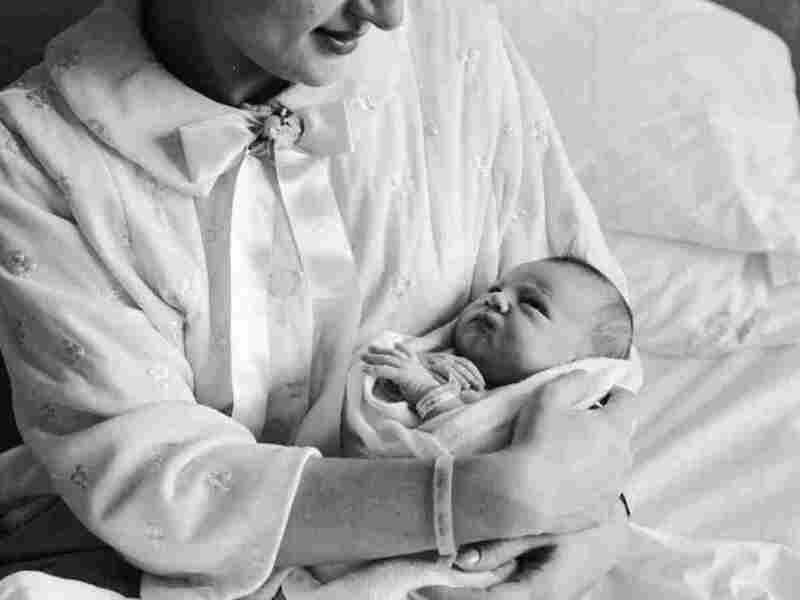 Fifty years ago, the typical first-time mother in the U.S. took about four hours to give birth. These days, women labor about 6 1/2 hours. The typical first-time mother takes 6 1/2 hours to give birth these days. Her counterpart 50 years ago labored for barely four hours. That's the striking conclusion of a new federal study that compared nearly 140,000 births from two time periods. One big implication: Today's obstetricians may be rushing to do cesarean sections too soon because they're using an out-of-date yardstick for how long a "normal" labor should take. "That's absolutely correct," says Dr. Ware Branch of Intermountain Healthcare in Salt Lake City, a study author. Lead author Dr. Katherine Laughon of the National Institute of Child Health and Human Development agrees. The definition of a "normal" labor — the range of times when a woman in labor reaches certain milestones — was laid down in the 1950s. Contemporary obstetricians still use that "labor curve." "The past definitions of 'normal' labor have been used to draw the line as to when it's time to intervene with a cesarean delivery," Branch said during a telephone conference with reporters. "But what we've shown is that labor is actually longer ... than it was 50 years ago. That certainly calls for a reassessment of when one should draw the line for cesarean delivery." Last year Branch and his colleagues at Intermountain Healthcare calculated that the U.S. could save $3.5 billion by lowering the national cesarean delivery rate from 32 percent to 21 percent, which is the C-section rate in the Utah hospital system. A cesarean birth costs nearly $17,000, compared with $9,400 for a vaginal delivery. The reasons for today's much longer labors aren't entirely clear. They may have something to do with differences in today's mothers compared with their grandmothers. For instance, first-time mothers are about four years older on average, they have higher body mass, and they're more racially diverse. Today's babies are also bigger — for instance, first-borns are 4 ounces heavier today than the 1960s crop. But study authors say the most important causes for longer labors are what obstetricians do, not how their patients have changed. Even after statistically adjusting for differences in maternal and newborn characteristics, modern labors are still substantially longer. Laughon says part of the reason is a jump in the use of epidural anesthesia during labor. "That is known to prolong labor by approximately 40 to 90 minutes," Laughon says. "Of course, it's very accepted practice to help improve pain control during labor." Branch points out that up to 85 percent of contemporary laboring mothers get epidurals. "Once that's in place, they're in bed," he says. "In the late '50s and early '60s, how much did people get up out of bed during labor and walk around?" Another big change is that many more women have induced labors these days. That is, they're not permitted to go into labor spontaneously. One in three women had spontaneous labor, among women giving birth between 2002 and 2008. Women today are 19 percent more likely to get a drug called oxytocin, which increases the strength of uterine contractions. But this should shorten labors, so the study authors note that "if women were allowed to progress in natural labor without oxytocin, the stages of labor could be even longer with the same odds of achieving vaginal delivery." Laughon and Branch acknowledge their results may be controversial among some obstetricians — those who view it as an attack on epidural anesthesia, for instance. "Some skeptics are going to say, 'Gee, you really don't know the details about these two groups 50 years apart to be able to compare them fairly,' " Branch says. "That's a legitimate criticism." But the "plain and simple fact," they say, is that giving birth takes longer today. They say all they're suggesting is that today's routine practices "may need to be thoughtfully reconsidered."